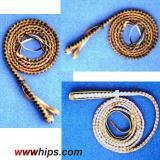 These are Mexican two-tone "bullwhips". I found this set of three - 4ft, 10ft, 12ft - on a flea market. Very light items, not recommendable for sports whipcracking.